The Maybank-MoneyTree Young Entrepreneur Start-Up Challenge (YES) was where I first learnt how to write an executive summary, pitch and gain valuable insights into the world of entrepreneurship. It was a one-of-a-kind business competition because unlike most competitions, where business plans usually end up in the dustbin after teams came up with it, pitched and won the prize, teams in the YES challenge are actually required to not just come up with a business plan, but also pitch to a crowd of investors to raise up to RM25,000 in pre-seed money to build a prototype, after which the best performing team in 4 months would win the competition and receive a further RM20,000 to go on and build the business. When I first came back to Malaysia after my ‘A’ Levels back in 2009, I was just a student who had no idea whatsoever about entrepreneurship or how to start a business. So, since I’ve decided to give entrepreneurship a try, I went to every single free or affordable talk and seminar I could find in an attempt to learn more about how to start a business and hopefully get to meet some mentors who could guide me along the way. In the process, I found out about the Maybank-MoneyTree YES Challenge, and got really excited about it, because I would get to not just learn how to build a scalable business that investors would invest in, but also get a chance to actually build it. However, you would need to have at least 2-5 people to participate in the challenge. That was a problem for me because the only people I know in Kuala Lumpur at that time were my primary school friends. So, I called up every single one of my primary school friends in an attempt to find a teammate, but unfortunately, none of them were interested in business at the time. Fortunately, one of them had a friend that she could recommend who was interested in business. I got his number and sent a long text with plenty of smiley faces explaining this amazing opportunity, to which he agreed to meet me at Starbucks, I explained the opportunity further and we were on. We first had to learn how to write a good executive summary, what makes a good scalable business and the fundamentals of starting a scalable and investable business. That was the first time I learnt what’s a barrier to entry, what’s a unique selling proposition, how to come up with financial projections and many other essential business knowledge. After coming up with an idea and submitting our executive summaries, 5 teams will then be shortlisted to pitch in front of a crowd of investors who could choose to invest RM500 to RM2000 each, where each team could raise up to RM25,000 to implement the idea. Surprisingly, my team was shortlisted to pitch, and that was the first time that I learnt how to make a business pitch. My team managed to raise RM25,000 to build the prototype, which we did, and managed to get a few clients and emerge as the best performing team at the 4 month mark. 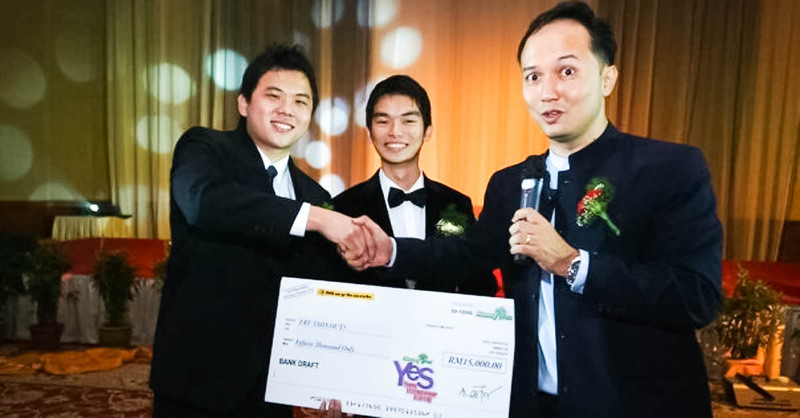 As a result, we won the challenge and got RM20,000 as prize money to continue building the business. In the end, we managed to breakeven, but we realized that although our idea [TryThisOut! – A market research firm focused on sampling & youths] could be a profitable million dollar business in the long run, it could not be the next big thing and could not scale because of the way the market research industry was structured, and our product was simply not disruptive enough. We were getting sub contracts or sub-sub contracts from big research firms or the leftovers from the research budget. We tried pivoting into a pure market research firm in Klarssen Intelligence and a role-playing video platform, but both were not able to change our position in the market research industry . We realized that it was turning into a conventional business that would take a lifetime to build and die together with us and no foreseeable exit strategy. Hence, after trying for quite some time, we decided to liquidate the company, return our investors their money with interest, explain to them our reasons for doing so and thank them for believing in us from the start. From this journey, I have learnt the fundamentals of how to build a start-up, from ideation, iteration, fund raising to execution. I have also learnt that a start-up is very different from a conventional business. It has the potential to change the way people or industries behave, must have the potential to be highly scalable, has the potential to be hugely successful and exit by way of a sale to a larger company or via an IPO, but at the same time, also has a very high failure rate, has much higher risks, would require multiple iterations and pivots before it finds its product market fit and sustainable revenue model. Basically, it has the potential to have a huge impact & be hugely successful, but is also much harder to build because the product and business has not been proven yet, and is often a moving target. Through this experience, I also managed to expand my network from which I managed to engage mentors who could help me on my entrepreneurial journey, learn about the funding ecosystem for start-ups from grants and angels to venture capitalists. I also learnt valuable lessons on execution and partnerships. All in all, this challenge served as a good foundation for me to start my journey and helped open the doors to many other opportunities.